The Tower of Laundry was leaning, definitely leaning, such that small children walked by at their peril. Meg’s formal schoolwork was calling. And I neeeeded to sew Hello Kitty pajamas for Kate. 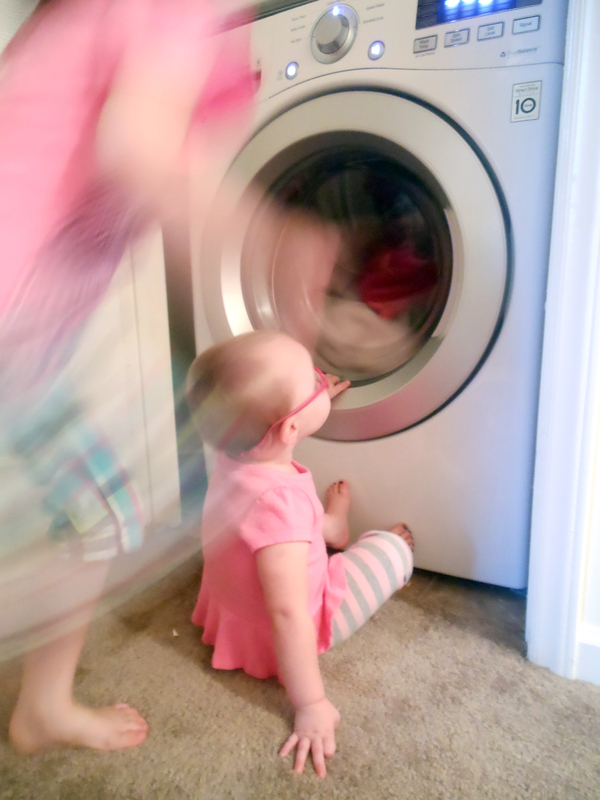 I always find it fascinating how other people manage their lives, very anthropological, so I thought for this post I’d talk about Homeschooling with Laundry. A few years ago, I went to Wal-Mart and bought eight or nine big cheap laundry baskets, and every few days, I’ll go through the fresh accretion of laundry and sort it amongst them. Then I’ll do a couple loads, depending which ones look most desperate and how motivated I am. This particular day, I discovered loads for jeans, dress pants, lightweight whites, heavy soil whites, whites that needed to soak in Oxy-Clean overnight, hot water reds, cold water pinks and reds, cold water blues and grays, cold water blacks and browns, and delicates. It was absurd. I appropriated the girls’ bathtub and set the whites in to soak (no baths for you, girls), and started a load in the washer. I am a laundry sorter, for sure. (This is where my non-sorter friends start giving me weird looks.) But I have good reason for my categories, really. I have to sort the red out from the white, or the whites all end up pink like Flinders Petrie’s underwear. He was a Victorian archaeologist, an Egyptologist, who was notorious for excavating in his pink skivvies – partly because it was hot, and no doubt mostly to fend off well-bred tourists. I don’t know if his underthings started life as pink, but I know what he did to canned peas, and I suspect the worst of his laundry skills. Pink underwear is fine if you want it pink, but not if it’s supposed to be white. Besides color, I also sort by whether the load is nasty enough to need hot water and by how heavy the fabrics are. I want to wash jeans separately from tees, because jeans are bullies and they’ll beat holes in anything fragile. Hot water is harder on fibers than cold, so everything lasts longer if you can wash it in cold. If it’s particularly delicate, I won’t wash it in hot water at all. If something has intense stains, I’ll pre-soak it for a while. The laundry baskets look kind of beautiful, filled up by color like that, and on happy days I stack them in rainbow order. On more pragmatic days, I stack them in the order I plan to wash them. Laundry started, I called Meg, and we started our school for the day. I like to begin with writing on the whiteboard the date, weather, phase of the moon, and something special about the day. Kate found a spare marker and whiteboard and played around our feet. Then Meg did handwriting practice, and we read history together. I left Meg doing her history project, a paper cut-out craft of a probably highly serious and symbolic King Cyrus of Persia, who appears to be wearing fairy wings and a truly amazing hat. I switched out the laundry. Kate likes to join me for that part, since Putting Things In and Taking Things Out is pretty much her favorite job ever, and laundry involves both. Sometimes, a little girl even gets to push buttons, which is the icing on the cake. 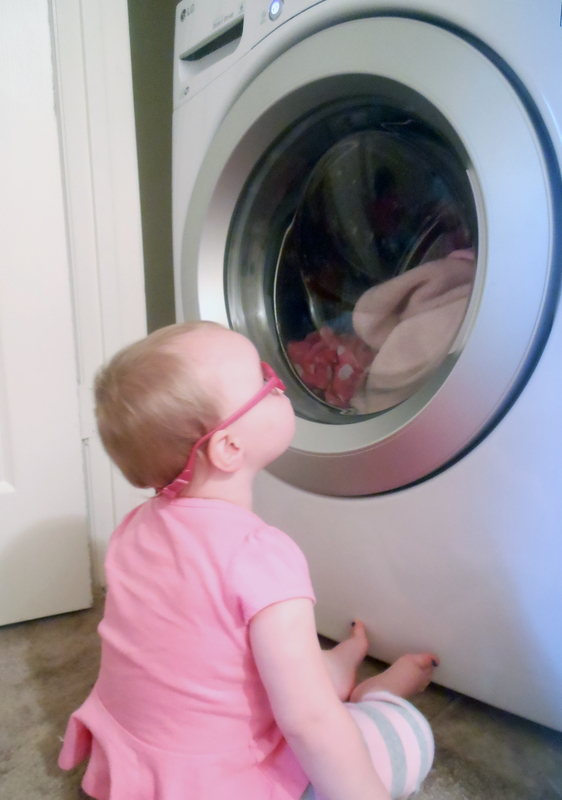 Then she likes to sit and watch the laundry swirl round through the porthole on the front. We reconvened school a little later, and I started Meg on her math workbook and her other workbook. She didn’t need much oversight this day, so I did other things. Whenever the washer or dryer sang, I jumped up and changed the load. I mostly folded as I went. After lunch, I put Kate down for her nap and pulled out my sewing. I managed to knock out a pillowcase and nearly to assemble a pair of flannel pajamas before she woke up. Meg finished plenty of school, so I let her watch a movie. I chunked through almost the whole stack of baskets. The day finished pretty pleasantly, but at the end I was asking myself why I was so tired. Then I thought about it for about half a second. Because I work harder at laundry than Flinders Petrie, that’s why. Photo Credit: First photo graphic design by Charity Klicka. All other photos by Carolyn Bales.